For those of you with a Nokia Windows Phone, remember when that CNN Application was officially announced, with the 90 day exclusive for Nokia devices? It’s now available on the marketplace for you. Everyone else, well, you have to wait three months for the application to show up on your marketplace if you don’t have a Nokia Windows Phone. The application has always looked impressive since it was shown off at CES 2012. 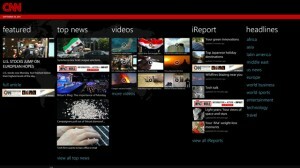 We can’t wait to get our hands on it and use the CNN iReport feature. If you have a Nokia device, let us know how you like the CNN application in the comments below or on the forums!